Albayda Establishment (Ae) is a Spanish private COMPANY offering to their customers a variety of solutions both, in domestic and foreign markets both for military and armoured vehicles. 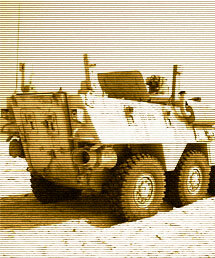 The areas where Ae develops its main activities, goes from the supply of original spare parts, maintenance of complete fleet of military and armoured vehicles, set up of maintenance workshops, highly qualified personnel, to the complex upgrading solutions including design and manufacturing of armoured vehicles. Albayda Establishment is fully prepared to undertake any of the mentioned solutions delivering not only equipment, but also highly qualified personnel to our Customer’s sites. Such commitment leads Ae to be the first Spanish company to provide maintenance of military vehicles for governmental institutions in foreign countries, having the 80% of our turnover in the export market.